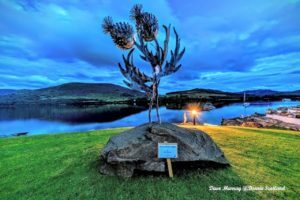 The Bliss Trail audio tour on Geotourist is set to bring art and architecture to life in the Loch Earn region. The unique BLiSS trail links the Scottish villages of Balquhidder, Lochearnhead, Strathyre and St Fillans through a series of art and architecture installations. Developed by the Loch Earn Tourism Information (LETi) Group, the trail took the Innovation in Tourism award at the 2018 Scottish Thistle Awards National Final. Geotourist has developed the new audio trail working in collaboration with LETi. 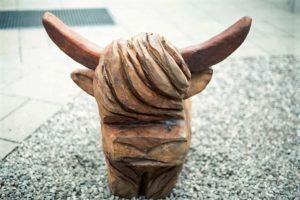 The GPS audio BLiSS Trail Tour takes in a variety of artist and architect designed installations including ornamental features such as an highland cow, a miniature mill house, stag, totem pole and old red phone box. Kim Proven, Chair of Loch Earn Tourist Information Group said: “Loch Earn Tourism Information (LETi) businesses and communities are incredibly proud of their regional and national Scottish Thistle Awards for BLiSS trail innovation and working together. Our latest collaboration with Geotourist has been fun in the making and it enhances the BLiSS trail story further. The new audio tour helps LETi to improve its BLiSS trail attraction, plot the trail’s naturally beautiful location on the world map and talk to global audiences via mobile app and GPS technology. Geotourist – an innovative audio guide enabler – has given us the opportunity to collaborate with sculptors, students, business members and other partners who have recorded unique stories surrounding the art installations. The celebrated BLiSS trail tour is an important addition to the Geotourist map. The Geotourist BLiSS trail tour underpins the opportunities that exist when communities with a common goal come together – and as this is how the BLiSS trail came into being, we’re delighted to see the trail tour extend across the Loch Earn region and Rob Roy Country, taking in the communities of Balquidder, Lochearnhead, St. Fillans and Strathyre. The inimitable Kim Proven intuitively understands how individuals and small businesses can work together to create something out of nothing. 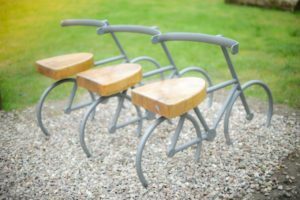 A true gift from the community that brings smiles to locals and visitors alike, the BLiSS trail physically draws visitors through the region ensuring that they can access all the sculpture and public art as a whole piece. The Geotourist audio tour allows people to digitally immerse themselves in the trail, whether they are right in front of any of the pieces or on the other side of the world and listen to the stories shared by the artists themselves or local community members involved in the project. We are delighted that BLiSS won the Thistle and truly enjoy working with Kim, as we do with all the regional Thistle winners. Making great things happen is worthwhile and always easier through collaboration and we are proud to share all of their stories.